Visions of Jesus Christ.com - Marisa Rossi - Stigmatist. Marisa Rossi with the stigmata. Top left photo in the afternoon of January 15, 2004 an extraordinary eucharistic miracle happened. In the past, many times, the Eucharist, brought into the thaumaturgical place by Jesus, Our Lady, the angels and the saints, was laid down on some flowers, in the sacred vessels on the altar, but this time Our Lady laid down a host on Marisa's bleeding forehead. Top right photo visible stigmata on Marisa's wrists. 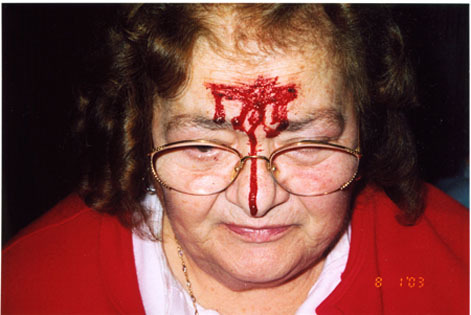 Bottom photos stigmatic cross engraved on Marisa's forehead bled again. Above top image from [here]. Below images from [here]. At the beginning of 2003 Marisa's stigmata have opened again and have bled abundantly for some weeks. The Lord asked the visionary to suffer his Passion for the renaissance of the Church, for the Bishop and for the end of the wars all over the world. 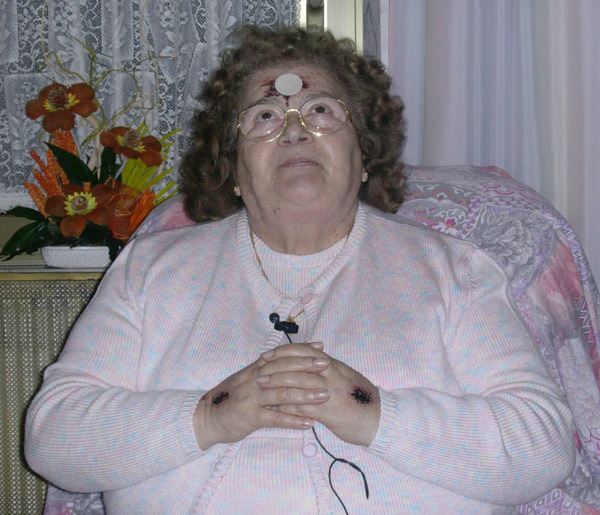 Between June 18 and 20th of 2003 the invisible stigmata of the visionary Marisa Rossi have opened again. The wounds in the hands and in the feet, on the forehead and in the right flank have bled many times in the following days. Marisa has suffered unceasingly the passion for many days for the renascence of the Church, as was said by Jesus. 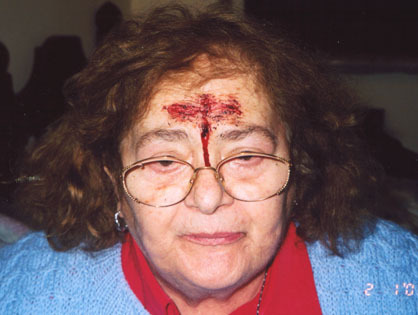 Moreover for some hours she has been suffered from blindness, caused by the crown of thorns. I am The Mother of the Eucharist, know Jesus' word. Love Jesus the Eucharist. 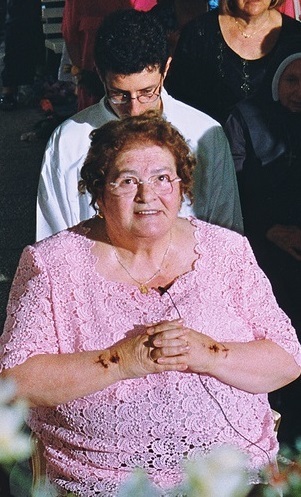 Since 1971 Marisa Rossi has been assisted by the Bishop Claudio Gatti, her spiritual director, who founded the Movimento Impegno e Testimonianza -"Madre dell'Eucaristia", a prayer movement for the "Triumph of the Eucharist". H.E. Mons. Claudio Gatti acknowledged the supernatural origin of the apparitions and of the Eucharist Miracles (Decree of September 14th 2000) The apparitions ended with the visionary's death, happened on August 8th 2009. Learn more about these events [here].